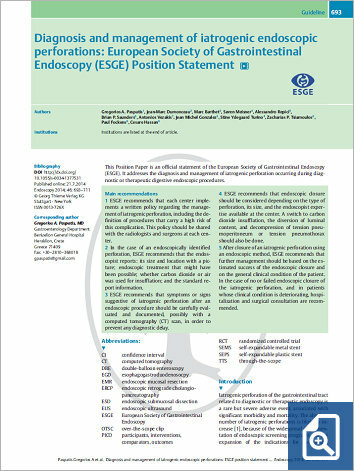 This Position Paper is an official statement of the European Society of Gastrointestinal Endoscopy (ESGE). It addresses the diagnosis and management of iatrogenic perforation occurring during diagnostic or therapeutic digestive endoscopic procedures. 1 ESGE recommends that each center implements a written policy regarding the management of iatrogenic perforation, including the definition of procedures that carry a high risk of this complication. This policy should be shared with the radiologists and surgeons at each center. 2 In the case of an endoscopically identified perforation, ESGE recommends that the endoscopist reports: its size and location with a picture; endoscopic treatment that might have been possible; whether carbon dioxide or air was used for insufflation; and the standard report information. 3 ESGE recommends that symptoms or signs suggestive of iatrogenic perforation after an endoscopic procedure should be carefully evaluated and documented, possibly with a computed tomography (CT) scan, in order to prevent any diagnostic delay. 4 ESGE recommends that endoscopic closure should be considered depending on the type of perforation, its size, and the endoscopist expertise available at the center. A switch to carbon dioxide insufflation, the diversion of luminal content, and decompression of tension pneumoperitoneum or tension pneumothorax should also be done. 5 After closure of an iatrogenic perforation using an endoscopic method, ESGE recommends that further management should be based on the estimated success of the endoscopic closure and on the general clinical condition of the patient. In the case of no or failed endoscopic closure of the iatrogenic perforation, and in patients whose clinical condition is deteriorating, hospitalization and surgical consultation are recommended.